Chinese Catholics leave the Mindong underground Catholic church after attending the Good Friday service in Saiqi in southeast China’s Fujian province March 30 Good Friday celebrations in one Chinese parish had a conspicuous absence: their bishop, who just the day before was whisked away by the government. 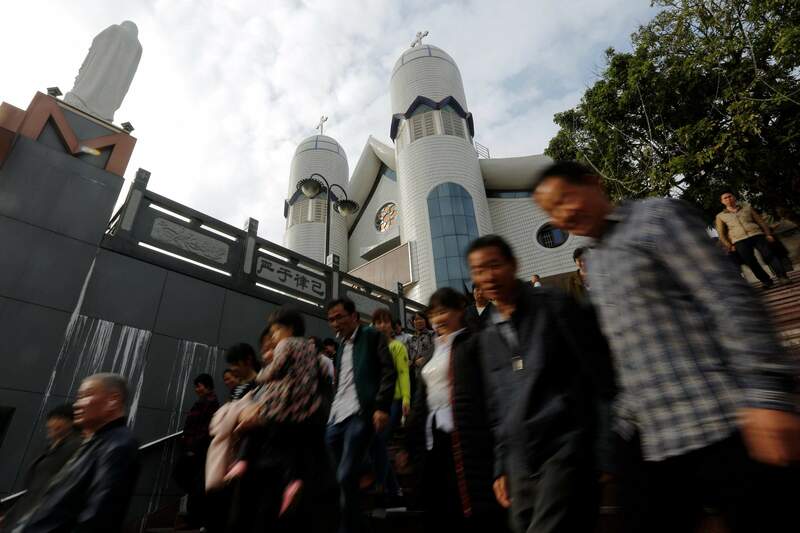 SAIQI, China – The twin-spired church in this southern Chinese village was packed with more than 1,000 Catholics observing Good Friday, but the bishop who tends to the congregation was not among them. Just a day earlier, government agents had taken him away. Bishop Guo Xijin is at the center of talks between the Vatican and the atheist Communist Party that will likely yield a deal on who appoints bishops in China. The move would be historic, uniting the country’s Catholics for the first time since Beijing and the Holy See severed relations nearly seven decades ago. At a pre-dawn Mass on Thursday, Guo had urged congregants at the Saiqi church to be brave and keep the faith. “Full of comfort and hope, we are inspired to more bravely face struggles and offer our love to God,” he told them. Not long after, government agents arrived and for the second time during Holy Week took Guo away for what they described as a “vacation” – a euphemistic term in China for an enforced disappearance. For years, China’s Catholics have been split between those who follow state-authorized churches outside the Vatican’s authority and those who attend underground churches that swear fealty to the pope. Guo is the head of one such underground diocese. Under the deal being discussed, the Vatican is expected to recognize seven Beijing-appointed bishops not chosen by the pope, and Guo and one other underground bishop would step aside. Priests and their followers perform a procession during a Good Friday service at the Mindong underground Catholic church in Saiqi in southeast China’s Fujian province March 30. Supporters say the deal would help the Holy See achieve its years-long goal of bringing all of China’s 12 million Catholics ostensibly under the pope’s wing. Others, including a prominent Hong Kong cardinal, have accused the Vatican of selling out its followers to an authoritarian regime. Guo’s exile serves as a stark reminder of the power of a state that has been seeking to center the people’s devotion on the ruling party. It also highlights how high-level deliberations in the marble-columned splendor of the Vatican City and in Beijing’s walled leadership compound could have reverberations in places like rural Saiqi for generations to come. Guo’s church sits atop a sloping hill overlooking meandering streets of small barbershops and noodle joints. Parishioners say they don’t know what to expect from a deal they discuss mostly in whispered conversations between morning and evening services. For decades, they say, they’ve been able to peacefully practice their religion despite being under the watchful eye of the state. But it wasn’t always that way. The story of the Catholic Church’s dark period in China during Mao Zedong’s Cultural Revolution has been told and retold to the young people at Guo’s parish. They’ve heard the tales of elderly relatives having their Bibles torn up, being paraded down the streets during public shaming sessions or sent away to labor camps. “That generation had to go through so much,” said Huang Weiping, 37, who manages a shop selling rosary beads and portraits of Joseph and Mary. He said his relative was Guo’s predecessor, Bishop Huang Shoucheng, who spent many years in prison. Lin Qigua, a 55-year-old parishioner, said bridging the divide between the official and underground church would be difficult. The state-backed Chinese church at recent conferences has stressed the need to remain independent of the Vatican and to “Sinicize” itself – code for accepting party leadership and rejecting foreign links. 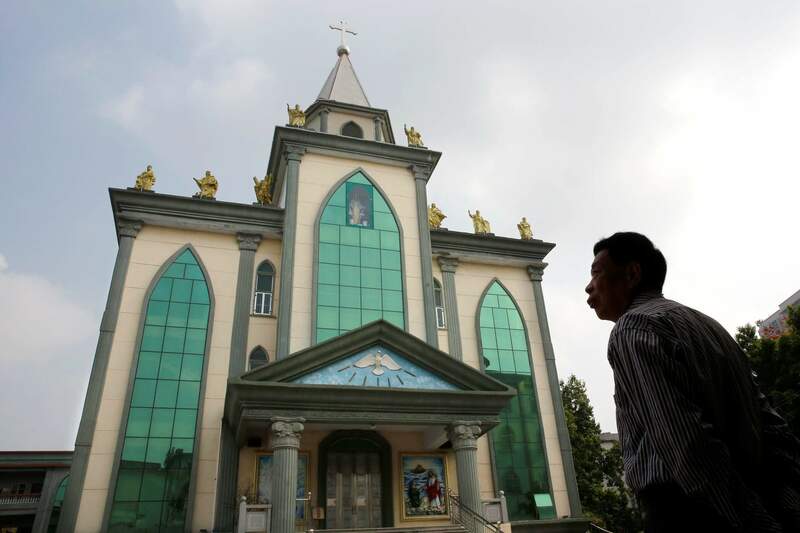 A man stands outside the Hepo underground Catholic church in Jiexi county in south China’s Guangdong province. 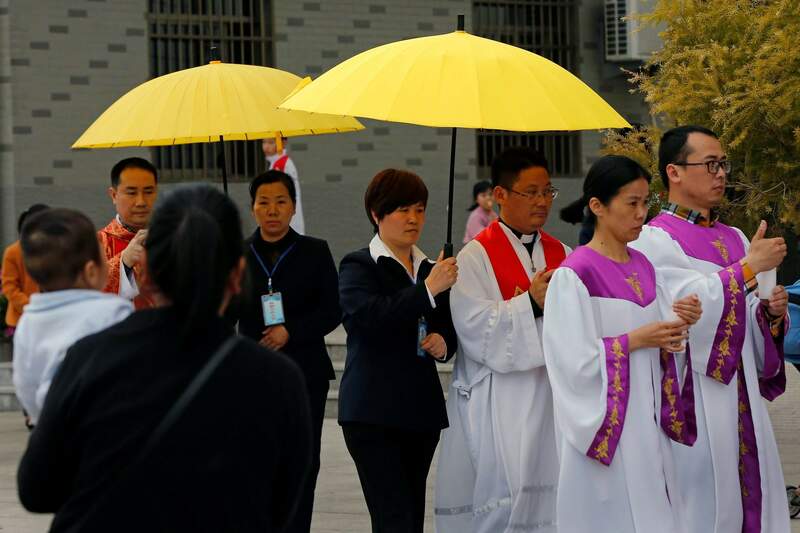 Good Friday celebrations in one Chinese parish had a conspicuous absence: their bishop, who just the day before was whisked away by the government. A Vatican official who spoke on condition of anonymity because he wasn’t authorized to reveal the content of the talks with China acknowledged there were downsides to the potential deal. The official said it would limit the Holy See’s activities in China and cede power to Beijing to nominate bishops, with the pope only able to exercise what amounts to a papal veto. China’s State Administration of Religious Affairs declined to be interviewed. The underground Churches have had regular communications with Chinese authorities since the 1990s, and officials even ask the church for help with local disputes, said Rev. Peng Zhenkang, a priest in Guo’s parish. “Villagers here will listen to clergy,” Peng said. He said Guo is often taken away during “sensitive” periods and that the bishop doesn’t resist. This time, Peng said, his exile was surely linked to the Vatican talks. “It’s inconvenient for the bishop to talk right now. I’m sorry,” Rev. Xu Wenming said before hanging up. The Vatican official said that under the proposed deal with China, Guo would become an auxiliary bishop to the official, state-recognized Bishop Zhan Silu, but would remain in charge of the churchgoers he had been leading. The official said Guo has agreed to that arrangement. The other Vatican-appointed leader who would be affected by the deal is 88-year-old Bishop Zhuang Jianjian, the head of a rural parish in Guangdong province housed in a weathered stucco church built more than a hundred years ago. Zhuang is described as a pillar of the Catholic communities in the villages clustered in Jiexi county. For decades, he has nurtured generations of Catholics and frequently administers blessings over newborns or newlyweds, the dead or dying, his parishioners say. The bishop declined to speak to reporters outside his church. “Please forgive me,” Zhuang said, bowing in apology. While several of Zhuang’s parishioners expressed admiration for the bishop’s generosity and dedication, none were certain they would oppose his departure if the Vatican ordered it. Zhuang’s proposed replacement is Bishop Huang Bingzhang, who Beijing ordained “illicitly” in 2011 without Vatican approval. Zhuang declined to be interviewed. One of his priests, Rev. Xu Jihua, said he expected Huang to be ordained by the Vatican. He said ending the divisions between the Vatican and Beijing will be good for Catholics across China. “No one hopes to live a life of faith under these abnormal conditions,” Xu said.